Garter st scarf (length between 96-142cm (38-56in): width 12-15cm (5-6in) depending on size: 4-9yrs 2 balls, 10yrs to adult 3 balls. Chevron scarf (length between 98-144cm (38-57in), width 14-17cm (5.5-6.5in):4-9yrs 2 balls, 10yrs to adult 3 balls. Ribbed snood: 4-12yrs 2 balls, adult 3 balls. Cabled snood: 3 balls all sizes. Based on 50g balls 50% wool/ acrylic blend chunky. Tension 14st/ 19 rows to 10cm, 6.5mm needles. 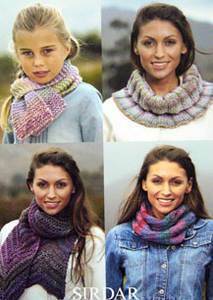 Shown in Sirdar Escape chunky. 6.5mm needles, cable needle for cabled snood.